Seaports and airports play a significant role to deliver international humanitarian assistance during disasters, as they channel most of the required personnel, equipment and supplies that is brought into the affected country. For example, international response to the food crisis in East Africa from 2007 to 2012 relied on the ports of Mombasa, Djibouti and Port Sudan with last mile transports being realized with 20-30 metric ton trucks. Both seaports and airports represent complex systems that comprise various modes of transportation and communication, with many employees on site. Moreover, they are based on large public and private investments and are often part of the public image of their cities or nations. Regardless of type, ports are vulnerable to and need to be made resilient against physical damage, disturbances of operations, demand exceeding capacity, and lack of specialized equipment. Civil disorder and epidemics are further factors to be considered. 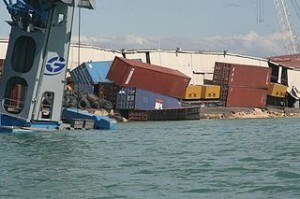 Ports that are used for relief efforts can be situated within the area that is affected by a disaster or far away from it. Efforts aimed at attaining port resilience fall into five general categories: policy, organizational (relationships), procedural, structural, and defensive. Resiliency measures that cut across the first three categories are – protection of key employees and their families and creation of priority plans for competing use in case a port is stressed by disaster relief efforts. Any effective attempt to improve port resilience requires interaction among many partners, i.e. owners and operators of the port, its regulators, the financial sector, normal users of the port and humanitarian organizations; hence public-private partnerships have great advantages for port resiliency.